Diagnosis must take into account contingency plans for problems that might arise in the future. Patients are entitled to the treatment option that has the best chance of success. Often the patient is only offered the choice of fixed bridgework because of a misconception that fixed bridgework is better than removable bridgework. Too often fixed bridgework is fabricated on questionable posterior teeth. When those teeth fail, the patient ends up wearing a second rate clasp partial denture that is transitory to a full denture. Because patients are often reaching financially to have sophisticated dentistry, they should have the option of a first rate attachment case at the start. 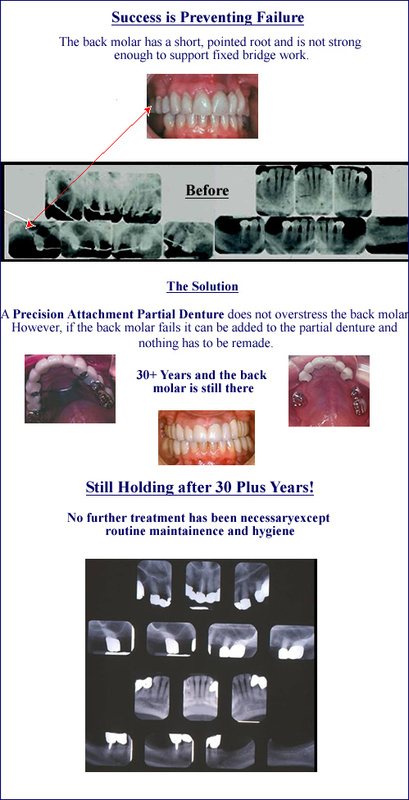 However, if an attachment case is made from the start and a questionable posterior abutment fails, the case does not have to be remade. The crown is added to the partial denture with acrylic and the patient continues with the same case. It is amazing how long some of these questionable teeth last when they are part of a precision attachment case. The reason they last longer is that they are relieved of the burden of primary support for the case. This case with four attachments was completed in 1975. Note that the upper left molar has a short root shaped like a nail instead of having curves like a screw. This type of abutment tooth has a questionable prognosis for fixed bridgework. The X-Rays, however, show little or no changes have occurred in 25 years as a result of the action of the attachment. The patient has only had routine maintenance (relining) of the partial during this time. Very often questionable teeth last far longer with attachment cases than they would with fixed bridgework.